On your right below the extended union is the building dating from 1895-9,now called the Heydon Laurence building. 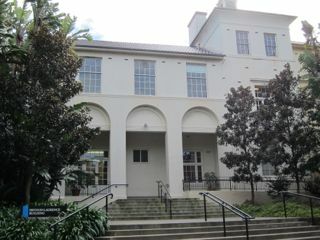 It now houses biological sciences. Below the Union, buildings were added in before and just after the first world war as money became available and the grounds ceased to provide agistment for cattle and horses. They were mainly designed by the government architecture Walter Liberty Vernon in Federation Arts and Craft style, which was judged appropriate to blend in with the general design of the main buildings. This was drastically altered by Wilkinson in 1923 and 1939-40. He added a second storey and changed the entrance from north to south so that it fronted onto Science Road. It was further extended in 1992 in Wilkinson’s style. The building was renamed to commemorate George Aloysius Makinson Heydon, a distinguished parasitologist, who worked in Tropical Medicine, and his cousin Joan Laurence who made a bequest of 2.5 million dollars to the university in his memory.